Me and the Little Rascals: 3 Layouts To Share! Good morning!! It is so nice to walk back into an empty house after dropping the kidlets off at school. I love them to bits, but on school mornings I feel a bit like a drill seargent, snapping out orders left, right and centre. Funnily enough though, I always can't wait for 3 o'clock to roll around, so I can go and get them again. 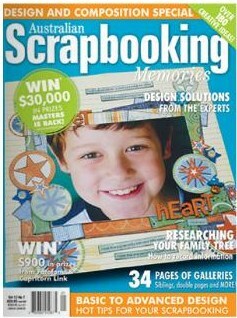 A couple of layouts that were published recently in Scrapbooking Memories. Just a simple layout out of some scraps. Love the chipboard banner and the glittery paper and alphas. Make sure you check the Handmade By Suzanne, that shop has the best prices I have ever seen! Well, I think I'll head off to do some scrapping. I have a very special class coming up for Harrison's Little Wings Charity, and I can't wait to get stuck into the class kit. It is full of lots of yummy Fancy Pants, Prima and Maya Road...I love it! If you're in the Brisbane area, I'd love it if you could come and support this great cause. My class will be $25, with all proceeds going to the charity, and it will be AWESOME VALUE with the kit itself being worth at least $25. I'm planning to do a double page layout, a single page, and possibly another page as well. The class will be on the 12th of March, and you can find all the details HERE. Well, I think it must be coffee and scrap time :) Hope you have a fabulous day!! Beautiful layouts! I wish I were in Brisbane then :( Good luck with the class. Gorgeous layouts Sam! I love how you have incorporated the Kraft Fancy Pants in your Snuggle Bug layout. Good luck with your classes. these are beautiful Samantha! I especially LOVE the one with the button circle!! So creative and fun! Such great layouts and that's a fantastic thing you are doing with your Charity! I wish you all the best. Would love to come along but I'm a bit far from where you are. Hope it goes great on the day! Such sweet layouts Sam and terrific use of colour. Fabulous layouts Sam! I saw the first two in SM. The Snuggle Bug LO is so adorable and Little Miss Bossy is such a fun photo and LO. Love the last one for HBS too. Will miss your work in our gallery.